One of the most over-looked ways to go green is the practice of composting. It is a simple and easy way to turn waste that would be thrown out into a useful resource. Compost in small amounts can change your life, compost in large amounts can change cities. 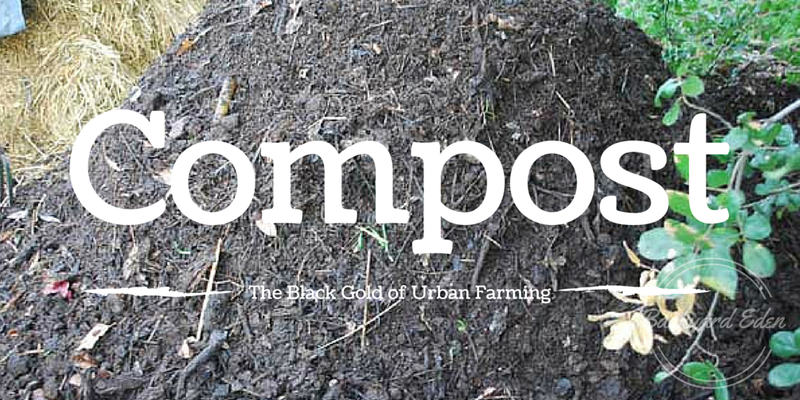 With this talk about lives being changed, you have to be wondering, what is compost? Compost simply means decayed organic material used as a plant fertiliser. Basically, compost is broken down waste that eventually turns into soil and then is used to amend gardens. There is nothing more important to a gardener than compost. As a matter of fact, compost is considered the “black-gold” that fuels the garden by re-charging the soil with the necessary nutrients and micro-organisms needed to produce delicious fruits and vegetables. 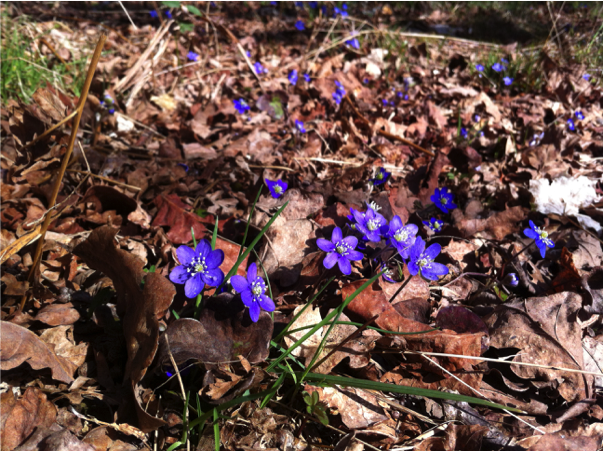 When a plant grows , it uses up resources found in the soil. Think about it like this: you work in an office where you make copies throughout the day, you go into the copy room to use the copy machine only to find out there is no copy paper anywhere to be found. The room was out of paper because no one chose to re-stock it for the next person. Plants using up nutrients can be seen the same way. If no one replaces the nutrients the next planting will not have enough to thrive. We can refill the nutrients by adding compost to our soil. Next week: Why is the development of traffic so important to a greener life? Would you like to be notified when the article is available? Composting is a natural process of Earth. The earth naturally does this process itself in forests across the globe. In the fall, the leaves start to change colours and eventually fall to the earth. Layers upon layers of leaves rest on top of the soil and breaks down over the winter making food for the trees. This topsoil compost found in forests is called humus. This process helps the trees continue to grow, helps retain water in the soil by adding a layer of mulch and provides food for the natural micro-organisms found in the soil. There is a circle of life found in this system, everything working together to thrive. This works so well that we have imitated it in our gardening/ growing techniques. The Back to Eden and Hugelcultur methods both use a similar concept of building soil by layering organic material that slowly breaks down. 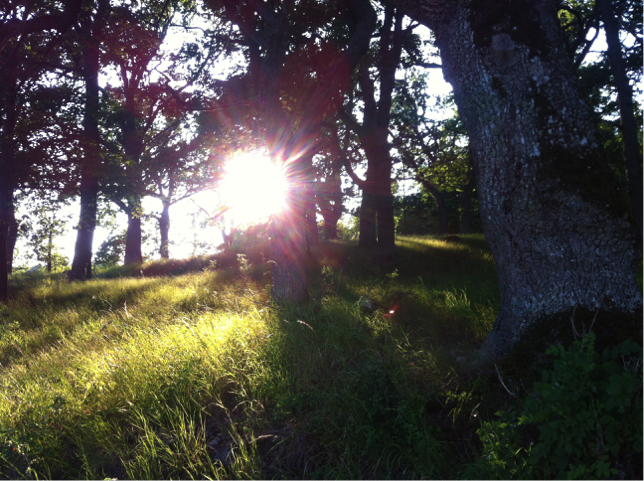 The earth has already lined out how to compost by the model that is given by our forests. Can we simulate the natural composting process in our homes and gardens? Yes, absolutely and it is easy too! 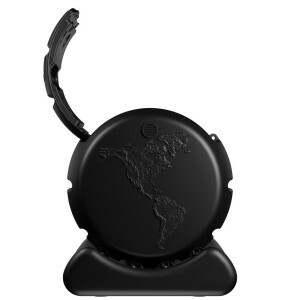 I believe every home should be composting in order to give back to their piece of earth. You can use almost any vegetable matter that you would have left over in your kitchen such as tea bags, coffee grounds, bits and pieces of paper. Leaves and grass clippings from your yard​ also make great compost ingredients. 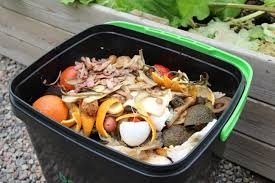 Their are some things to avoid putting in an open compost such as cooked foods like meats, dairy or any fatty foods. Getting started with composting is easier than it seems because there are several ways to compost and products to help you. 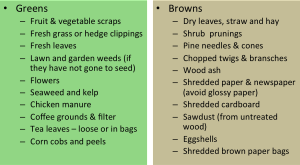 The way you choose to compost is up to you but will greatly benefit you and your garden. The method you choose will also depend on the resources you have available; the space you have to devote, how much and what type of waste you produce. 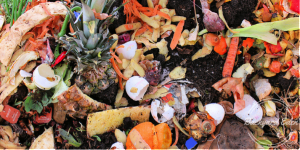 The different types of composting are hot, cold, indoor, outdoor and vermi composting; however no matter what method you choose they all have the same basic principle. 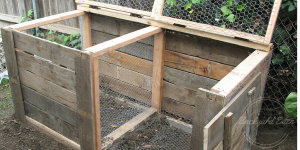 In this article we will look at the “lasagna” method of composting which is a type of hot composting. The idea is to layer the different materials in such a way that the pile will heat up and break down faster. 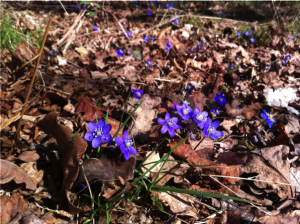 Examples of nitrogen rich “greens” and carbon rich “browns” . As we said before compost means decayed organic material so composting is the process by which we allow that material to decay and break down creating that nutrient rich black gold for your garden. oxygen in order to properly break down. These four things are absolutely crucial to making your own compost. The compost pile needs the proper balance of the necessary ingredients and just like in life that balance can be hard to find. Once you get the balance down you will begin to make some of the best compost and it will supercharge your garden. 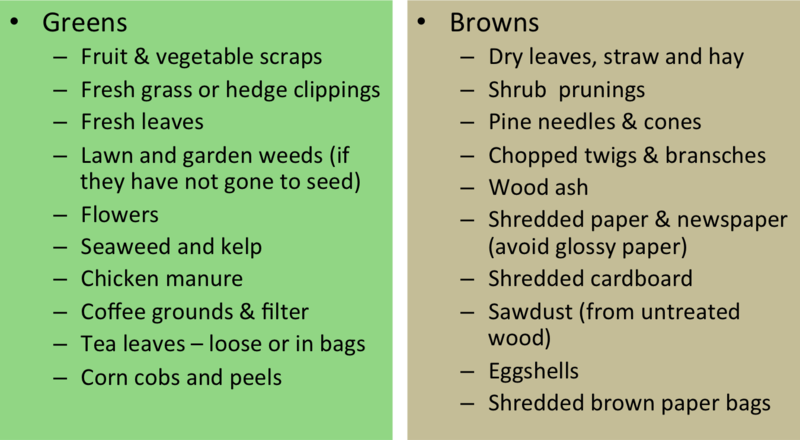 Some of the best ingredients to compost are leaves, grass clippings, household kitchen scraps such as eggshells, peals and other vegetable materials (see Greens and Browns pictures above). The easiest way to start composting is what gardeners call the lasagna method by starting a compost pile by layering nitrogen rich “green” materials follow by a layer of carbon rich “brown” materials. Alternate these layers as well as add water and some soil every couple of layers will put you well on your way to making compost. 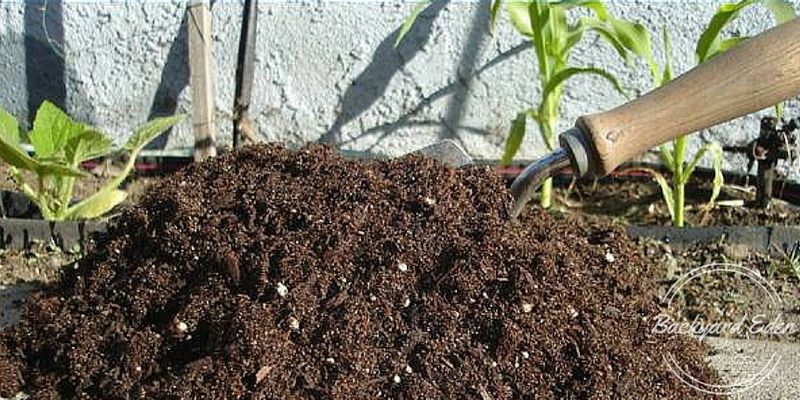 ​Soil from your garden would work or some organic compost from a local garden center would work. 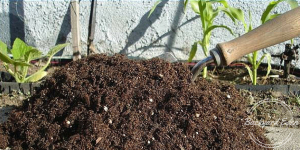 The reason you add in some soil is to add in the micro organisms into the compost pile to speed up the process. The water in addition to the other ingredients will cause your compost pile to heat up starting the decomposition process. You want to make sure to turn it every couple of weeks so that oxygen is introduced into the pile in order to aid in the material break down process. This process can take anywhere from 2-12 months depending on the amount of time you devote to turning it. When the pile is almost completely broken down the pile will start to cool off some and it will be available to use in your garden or flower beds. That is the beauty of compost, you do not have to grow vegetables to be able to use it. Compost is great to add to flower beds, fruit trees or even indoor plants to add nutrients. Everyone should be composting not only to feed their plants and gardens but also to help reduce the amount of waste going into local landfills. With the availability of products to make composting easy in addition to the ingredients to make awesome compost even easier to find makes composting something that anyone can do. Why should we be composting? Composting is a great way to give back to our little piece of earth. If we are successful with our efforts to reduce our global footprint then we are working toward a future for children and grandchildren to be able to grow their own food as well. Help out by doing your part to make the world a better place for future generations. We googled for compost containers to be used in apartments or indoor. If you would like to learn more about composting and other gardening topics, check out Backyard-eden.com! Tellus Think Tank is happy to have the opportunity to connect with John and the very inspiring home page of Backyard-Eden.com and hope you might have been inspired to start your own compost! Next week: Tellus Think Tank visits the city of Gothenburg and their unique take on autonomous cars – taking a different stance compared to the Google Car project. Would you like to be notified when our next article is available, click here! Alternativ livingAlternative livesCan Earth be saved?Challenges of EarthChallenges of humanityCompostGiving back to EarthGlobal WarmingImprovements of lifeLifeOrganic foodPopulation growthSustainabilitySustainableSustainable citiesSustainable citySustainable communitiesSustainable communitySustainable foodSustainable livesTellus Think TankTellusThinkTank.comThe black goldUrban farmingVegetarian foodwe can save Earth!